Mark Winterbottom has earned his first ARMOR ALL Pole Position of the year at the Tyrepower Tasmania SuperSprint, edging his closest 2015 rival Craig Lowndes by a mere 0.0188sec. The Bottle-O Falcon driver flew off the road with two and a half minutes to go, but got the job done in the dying seconds of qualifying at the Symmons Plains circuit. 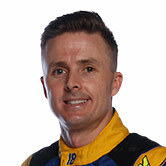 “[In the session there was a] bit going on, we had a very good car all weekend,” Winterbottom said. “I lost a little bit of rear grip – all those cars towing, I was off the track – but I got $1000, so I don’t care! A big lock up from Lowndes on a fast lap had him checking the front of his TeamVortex Commodore after the session. He didn’t seem overly concerned about an issue, saying there was no vibration, but did believe his car was good enough to have taken pole. “It was more of a lock up than I expected,” he said of a late off. The field was separated by just 0.72sec in the 15-minute session. Shane van Gisbergen was home third, but Lee Holdsworth was the big story of the session, set to start on the second row in the single-car Preston Hire Racing entry. TEKNO new recruit Will Davison – also in a Triple Eight car, as Holdsworth is – came home fifth and starts alongside highest placed Nissan Rick Kelly. A vibration reportedly bothered Jamie Whincup after practice this morning – the best he could manage was seventh. Others to note include Chaz Mostert in 11th and James Courtney in 17th. The V8 Supercars run 120km this afternoon at the Tyrepower Tasmania SuperSprint at 4.45pm local time.